The Bee Jays have seen this before. 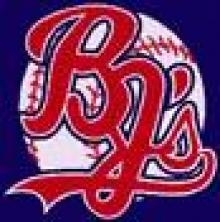 In a summer of many more ups than downs, a high percentage of the BJ downs have come against the last place Dodge City A’s. Dodge (17-26, 11-21) with only 15 players left for their last game rallied with six seventh inning runs to stun the Liberal Bee Jays (31-13, 22-12) again 9-7 Thursday night at Dodge City’s Cavalier Field. It’s the A’s third come from behind win against the BJ’s who otherwise would have won the league. Liberal jumped to a 6-0 lead after three innings by plating four in the first and two in the third. Richard Bohlken hit a two run homer in the third. But the A’s would rally in their final game scoring three in the fourth and six in the seventh to take the lead. The Bee Jays used four pitchers Austin Robson (four innings), Quay Grant (2 and a third innings), Travis Parker (two thirds), and Nick Youpel (one inning). Bohlken was 3-5 with a homer, double, and an RBI single in the seventh which made the score 7-3. Kelby Tomlinson was 3-4 with a triple and two more stolen bases. Liberal faces the Austin Gold Sox Sunday night at 7:30 in Wichita for the NBC World Series. The game will air on Talkradio 1270 and kscbnews.net.